On social media, the campaign generated 95,500 likes and nearly 2,000 comments. 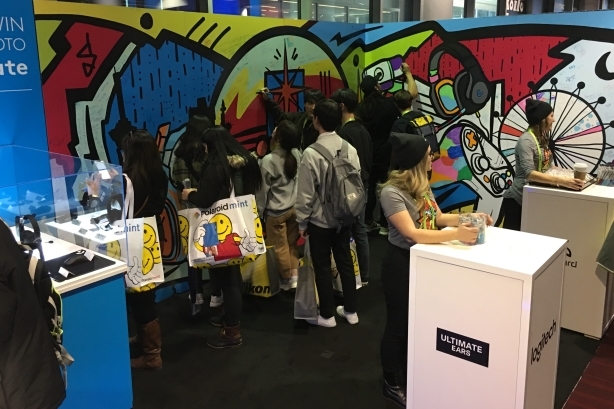 CES attendees add to Logitech's mural. At this year’s CES, the largest consumer electronics convention in the U.S., Logitech’s booth featured large, striking murals by Phoenix-based artist and designer Timmy Ham. Visitors were handed pens and encouraged to add to the mural. Logitech's in-house team started working on the brief in early September. To stand out on the frenetic convention floor, Logitech wanted to give attendees a space to hang out, relax, and draw for as long -- or as little -- as they wanted. At last year’s CES, Logitech partnered with a number of different local influencers. This year, however, the brand wanted to work with someone they already knew resonated with their consumers. Enter Ham, whom the company had worked with before. Whereas many companies give out products at CES, Logitech aimed to create an interactive experience. The visual nature of the booth, which allowed people to document their creativity, was also important. "One of the goals was to engage people onsite and online," said Krista Todd, Logitech’s VP of global communications. "We wanted to give [attendees] a break and let them have some fun with us," said Todd. Ham created four unique murals, which incorporated various Logitech products, including mobile devices, keyboards, mice, and iPad crayons -- one for each day of the convention. "It created an Instagrammable moment," Todd said. "People could share how they contributed to what the mural looked like at the end of the day." The goal was to allow people to come and engage for however long they wanted to. Products and swag bags are fine, Todd said, but Logitech was seeking interaction. The brand did, however, give away cookies, also designed by Ham. To promote the activation, the company also ran a contest. By identifying Logitech products featured in Ham’s murals, users were entered to win a prize pack. Ham was on hand, connecting with fans, both on-site and online. In addition to taking over Logitech’s Instagram stories, he posted a couple of pictures on his own account. Further, 400 people entered Logitech’s contest in-person, with another 1,600 entering online. A little sneak peak of 1 of 3 SLOTH x @logitech murals I’ve been working on for @ces ?? Super pumped to be going next week with Logitech ???? The booth set up is going to be so legit! You’ll be able to help me finish the murals each day. Stoked to paint with y’all! If you’re going to CES be sure come to the Logitech booth and say what’s up and help me finish these murals and grab a cookie I designed ? ?